Designed my own shoes. This is not as hard as it sounds. Shoes of Prey allows you to choose the style, material, heel size, embellishments, etc., and basically design your own shoes. So I did. My “writer” flats are leather uppers with a newsprint design and a black bow. Dressy and wordy. In other words, perfect for me. See a tall ship. Ever since I was a little girl watching Errol Flynn pirate movies, I wanted to see a three-masted ship. I’ve actually seen several now, some of my favorites being the Star of India in San Diego, and the USS Constitution in Boston. I love the creaking, beautiful ladies of the sea. Gamble in Las Vegas. I wanted to see Las Vegas at least once during my lifetime. It was everything I’d dreamed, a loud, colorful, overstimulating world unlike anything I’d ever experienced. But I almost forgot to gamble. On the last day of our Las Vegas trip, right before we left for the airport, DH and I took all our quarters and shoved them in a series of slot machines. When we finished we had $1.50 more than when we started. We won! Inspire a song. This one I completed with the help of Angela Correa of the band Correatown. I helped Kickstart her album Pleiades, and in return she wrote a song with one of my poems in mind. My poem was written about the first time I opened myself to a lover after my divorce. Angela’s song “Distillery” has that same feel with its lyrics encouraging the listener to “give yourself another chance”. I think it’s beautiful. Publish a book of fiction. Checkmark! You’re on my blog where I talk about my fiction. If you check out All My Books, you’ll see photos of my covers with links to where you can buy them or read them. Mark this one as done! Attend a performance of Tchaikovsky’s 1812 Overture where actual cannons are used for percussion. I love Tchaikovsky and the 1812 Overture. I’ve actually had a couple of opportunities to see this but always managed to be too ill or out of town…but I so want to hear this piece of music and feel the boom of the cannons in my chest and in my feet, battering at my ears just as the crescendo culminates. Join in a food fight. I realize how silly this seems, but it sounds like so much fun. You know you want to. We could even have rain ponchos and gloves. 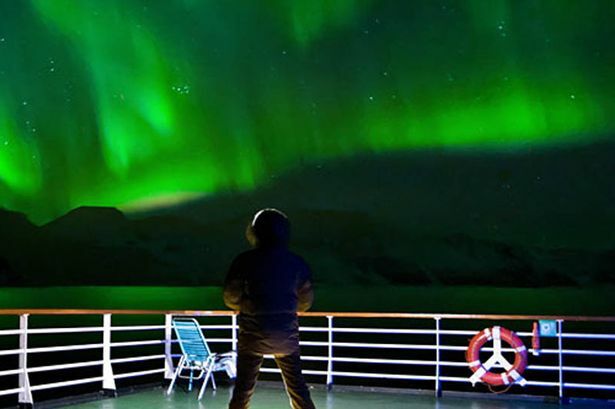 See the Northern Lights from the deck of a cruise ship. This one is probably a long way off for me. The Aurora Borealis is notorious for being unpredictable. Even if I managed to take a cruise during the right time of year (which for me is impossible because of my day job), the light show still might not appear. But I can dream. Knit a sweater I don’t mind wearing. I’m almost there on this one. I’ve knitted a poncho and three-fourths of a nice duster, but not a sweater yet. Must find more time to knit! Get a small tattoo. I’ve never managed to get a permanent tattoo although I’ve had several temporary ones. It will probably be small and hidden, maybe a just word. Sleep overnight on a train. There’s something exotic about sleeper cars and the swaying motion of a train. One of my favorite movies (that I consider better than the book) is Murder on the Orient Express starring Albert Finney. The beautiful furnishings, the sense of adventure, all call to me. Who knows, Belmond Hotels has a version of the Orient Express still running a route from Paris to Istanbul. Maybe one day I’ll get to sleep overnight on it! So I’m interested—what cool things are on YOUR bucket list?